Has anyone compared Sharepoint 2010 to Jive SBS? We are currenlty in a pilot of Jive, but IT is also setting up SP 2010 and have said it is much more user-friendly than WSS 2003 was... so they are wondering if we need Jive at all, or if we should move to SP 2010 completely. Is anyone testing both? Or using the SP connector to integrate the two? We are a big sharepoint shop as well. Currently on SP 2007 moving to 2010. However 2010 does not compare at all to Jive on its own. We did the analysis almost 9 months ago so my memory is fading. I recall that thei rmicrobloggin functionality was very poor. It was a one and done sort of thing where you could not reply to a thread...it was just not very good. It also required a lot more technical expertise to make it usable whereas Jive adds value right out of the shrink-wrap. Sharepoint has better success when they partner with Newsgator or other third parties...but the costs start to mount there as well. We do plan on using SP connector at some point, but right now focused on our Jive internal launch and we'll work on that in the next phase. Andrew, I would really like to see what criteria was used in the comparison between the two, and did you compare SP10 or SP07 to Jive? We used a pretty comprehensive set of platform and business criteria to evaluate Jive against SharePoint and Saba. Contact me directly and I'll be happy to share that with you. I was tasked to compare Jive and SharePoint 2010, I see that you have done a similar comparison. Would you be able to share your information with me? Attaching our criteria spreadsheet here. The criteria list is pretty decent as a check list. But the devil is in the details. For example tagging in SharePoint 2010 is there, but has major issues eg: can't tag a discussion thread (and there are others) My suggestion would be to develop use cases such as 'locate expertise' and 'collaborate on the creation of a document', and score the sucess of the platform in fulfilling the use cases. We are jive and saba partners. At this moment our approach is Saba (with Saba Live) as a social learning solution mainly for internal communities and jive like a really social solution with a broader scope (external communities, social media marketing) and higher integration capabilities with other social networks (Open Social). Do you agree or do you think at this moment Saba is a real competitor for jive and a mature solution? Personally, I don't. I think there is a big risk for point solutions trying to get into the social game because if organizations aren't careful, they will develop "islands of socialness". I'm much more an advocate of going with Jive as an enterprise solution, and then working with integration capabilities to extend social collaboration where it adds value. We do use the SP connector to tie our Jive implementation to our corporate SP based portal. In terms of SP vs. Jive, here's the basic comparison we did about a year ago. Using mind maps to associate and manage loosely coupled social networks. The specific software MindManager from MindJet.com. MindManager automatically maps SharePoint sites for ease of navigation. I like your mind map. Actually, I was building a map or decision matrix to visually show the tie with our social media tools. Explain by definition the Learner and the Aggregator. I believe I have an understanding of what you mean...but could you explain further. 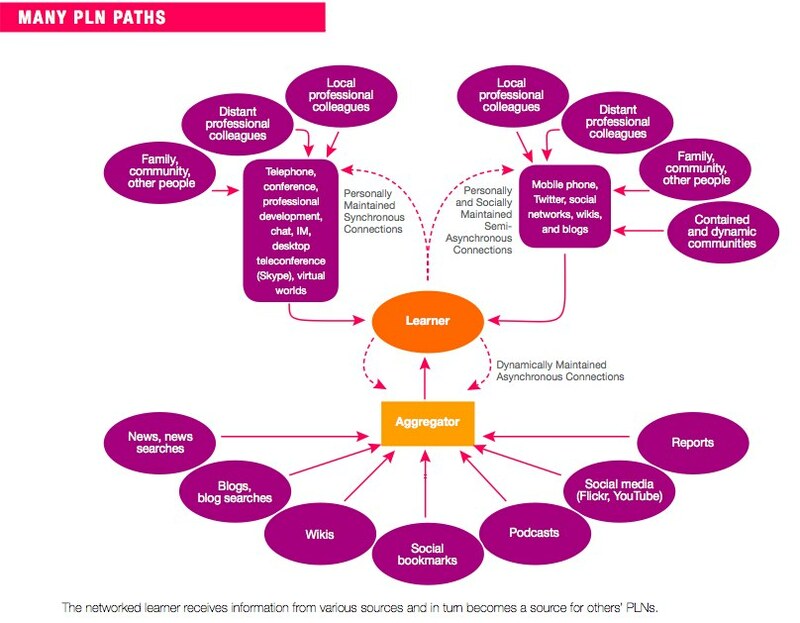 Also, should there be any "output" arrows pointing from the Learner back into the community? The learner is in a recursive relation with other learners. I pretty well agree with everything Roy Wilsker has said in the previous post. We have one small instance of Jive running (hosted) and are a big SharePoint shop and are engaged in a nauseatingly exhaustive evaluation of Jive and SharePoint 2010 - we currently have WSS 2003 and are evaluating the possibility of upgrading to 2010 Server. In a nutshell: SharePoint 2010 is simply not competitive with Jive as a social platform - but SP2010 may be strategic to you for other reasons - content management and it's abilities as a 'development light' platform. Having said that, the combination of SharePoint 2010 and the NewsGator plugin - which is what we are evaluating - makes it much more difficult to choose between the 2 based strictly on features and functionality. The major gap we see in Jive is lack of wiki functionality and the inability to manage nested document structures - but we haven't ruled out both SP and Jive and Jive has a pretty decent SP integration. For SharePoint the issue is mostly usability (partially fixable by way of a development effort - but we have a tough time assessing the scope of this) and some pretty clunky functionality (eg: can't comment on a document) - but NewsGator is doing a good job of filling these gaps. The slow Microsoft release cycle is mitigated by the speed with which NewsGator adds new features. Unfortunately not beyond the demonstrations from Jive. That would be part of a detailed architectural assessment and would follow the completion of our functional review. I will update you after. We have SharePoint 2007 and Jive 4.5 with the SharePoint Connector. Now that we have Jive it is effecting the SharePoint instance (i.e. how it's organized, the features we enable/disable, etc.). For example, SharePoint has MySites and Jive has Profiles...do we keep both? Sync them? Disable one? Where do we tell users to upload content SharePoint or Jive or both depending on the type of content? The plan of attack is to identify feature overlap...what features do each system share and which system does that task better? Add to that, of course, our user's needs so we can clean things up and remove unnecessary clutter and overcomplicated features that aren't needed. We're developing a user survey to find out what users and site owners heavily use in SharePoint. We will analyze the findings and create a plan for our SharePoint instance keeping in mind the user needs and our plans with Jive. We will also look at the survey findings to see if upgrading SharePoint to 2010 is needed, or not. I'm happy to discuss our plan if you're interested. That's interesting, Natalie. I'd like to see those results. When we did a SharePoint upgrade we specifically disabled MySites for just this reason (since we already have similar functionality in Jive). Would love to hear what you've done. Sounds like you have a similar setup. Are you game for a chat? That was basically our use case, too ("(i.e. doc libs, lists, workflow, calendar)"). I've enabled my email address to "friends" on the Jive Community, so send me a note about chatting. so kevin, maybe we talked about this alrady - but di you actuall implement SP2010 with Jive using the connector? You eliminated Mysites - what about SP team sites - so you use them at all or strictly used Jive spaces and groups? We are looking to use Sharepoint 2010 with Jive for our intranet. We found that we needed to have more control over documents and permissions within departments that we weren't able to do with Jive also to customize per department more. We just had this discussion about using Jive for the Profiles and not MySites. Jive seems to be better on the people aspect. What other items did you find that you either turned off in Sharepoint or found it work better in Jive? We had disabled MySites long before Jive....and we don't have these issues. So disabling MySites could be the answer. New message: "Sharepoint 2010 vs Jive SBS"
I appreciate the great discussion that is happening in this thread! My organization is just getting started on SharePoint, though there were separate pockets here and there in the past, IT has just installed SP 2010 and has a few departments using it who had been pushing for it; and we are just over a year into our Jive implementation. While I understand the push for SharePoint from an IT perspective (Microsoft shop, , it sounds like it may not necessarily provide all the features that we use and enjoy in Jive, and if technically SP "can" do them, it will be resource intensive and likely costly if we don't have the in-house know-how to replicate and implement that functionality in SharePoint. I also can't see being able to replicate Jive features with the capabilities of SharePoint Foundation 2010 (the free version). We too like the idea of the document and content management capabilities in SharePoint which we find with Jive are not as strong as we perhaps need, but there is lots to do in my organization around investigating SP and how we want to use it - and what problems users are wanting to solve with SharePoint. It's the ease of use with Jive that I think would get lost if we were to completely dive into SharePoint and stop using Jive, and I fear unless we put a lot of work and money into SP to replicate that ease of use, the strides we have achieved in gaining adoption and increasing collaboration over the last year piloting Jive will be lost. Thanks everyone for great input and thoughts on this subject! Feel free to keep it going!! I did not review NewsGator + SP2010. But I think you could make that solution work if your requirements for user experience are not high. At the time I felt Saba Social was not quite ready to compete with Jive 4.x. Though this was 8 months ago and Saba may have improved since then. SharePoint 2007/2010 has certain features that make it a complelling solution in the enterprise, as long as you are willing to customize and improve the out-of-box experience. I felt that Jive 4.x was a better match for our needs than SharePoint 2010 out of the box. The attached ppt is how I've been thinking of SP vs Jive. Depending on your own company requirements, there is a case for both platforms. We also have the Jive SharePoint connector and after a rough start with the integration, it works well for search integration. Gian, I am a huge fan of your presentations! Great use of imagery to tell a clear story. Thank you! Thank you all for this great discussion. We currently have Livelink communities and are exploring Sharepoint and Jive – we also have many questions and are getting many of them answered here. o Perform a search across (or within) a community and retrieve ALL the items relating to the key words. Most popular knowledge containing artifacts are: discussions, blogs, documents, wiki pages, links, people / experts. The Fluor have successfully split their environment into a “Projects Online” system to “work in/deliver on their work outputs /transactions” and “Knowledge Online” to capture, share and safeguard their knowledge. They were successful in splitting their “transactional” environment from their “knowledge environment”. · Blog / forums posts (new and replies) must be created from email address in Outlook. Users mostly “work” in Outlook, thus important for them to create content (ideas / suggestions ) by mailing forum / blog address. They only spend time on the site when they are LOOKING for stuff. I strongly support only one system, if not possible, then two systems with duplicate functionalities switched off (where possible). I have similar reqs and they are all met with Jive and SharePoint. I’m still working out the kinks but all in all I believe I have the right applications to meet the needs of my users. The SharePoint Connector for Jive is key here where it allows you to take advantage of SharePoint features (i.e. workflow, doc mgmt.) and pulls docs into Jive for the collaboration piece (i.e. doc rating and commenting). Jive search allows users to find all of the information from Jive and SharePoint. It also allows you to find people based on what they’re talking about/contributing to the community. I’m happy to discuss with you what we’re doing, if you’d like. We are approaching this in a very similar method. We have deployed the SharePoint Connector and it works very well. Our company is a SharePoint culture, but to be honest the vast majority of our population use SharePoint as a glorified storage space. They will use the versioning features and some use the workflow processes with SharePoint. However, only a very small portion of our workforce use SharePoint as a collaboration or social media tool. We made the choice in January 2011 to implement Jive. This is how I explain it to the community: SharePoint is the workroom - this is where we roll up our sleeves to build documents, spreadsheets, and charts. Jive (FlightDeck) is the conference room - this is where we meet virtually to connect, communicate, collaborate and create ideas. One is not going to replace the other - we will use them as partners. At this point, people are accepting the connection. Love the way you explain the difference (workroom vs. conference room). Are you open to chatting about your SP connector implementation journey offline? We are using SharePoint 2010 internally and Jive hosted. We will be implementing the SharePoint Connector, and I would love to talk with others who have done so already. When we evaluated social tools, we listed out the features we were looking for, but also the use cases for those features. This allowed us to better assess whether the tool actually met our needs (as someone pointed out, the devil is in the details). In addition,most VPs and C-level people aren't anxious to fork over money for "tagging, rating, and microblogging," so it was important to add the business reasoning for each. I've attached a blank version of our spreadsheet, which we used to evaluate about 7 vendors. We also had a set of criteria related to cost, market leadership, penetration, etc. Another consideration is the Swiss Army Knife versus chef's knife issue (an analogy that I have used often as well, so I think it's a good one). To take that analogy a bit further, we all know that once you start cooking, depending on what types of food you eat, you are going to want more than just a chef's knife. A paring knife, a bread knife, or other tools for special uses may be essential. If I were doing this process again, I would look for a social platform that allowed you to scale easily, the same way you would build your collection of cooking knives. The iPhone did this famously through apps, and Jive is following this same approach. SharePoint has a version of it in web parts, but these are much less plug-and-play than the apps appear to be. IMO, the apps approach is going to replace the Swiss Army Knife/one size fits all software paradigm in the near future. Geez, talk about late to a party. Somehow I have missed your request. I would be more than happy to talk offline or within this group about our journey with Jive and integrating SharePoint. We have a long ways to go, but we are finding ways to use these two platforms as partners. Here is a related discussion, for those interested in replacing SharePoint vs co-existing with it (both are good! ): What systems/apps have you replaced with Jive? One option we used while I was at Kaiser was to use SharePoint as the repository of choice and primarily for the check-in and check-out features as well as the better calendaring and project management tools set. We used the Jive SharePoint connector and continued to use Jive as the Social engagement vehicle. My company (ThreeWill) is in the middle of writing a white paper on a this subject (with help from Jive and some of the customers who have deployed the SharePoint Connector) - look for a follow up response from me in a couple of weeks with the update on this. The white paper is due for completion at the end of August. I'll definitely post a link to the white paper on this thread. We cover everything from a comparision of SharePoint vs Jive to pro/cons of options to make SharePoint more social (including the SharePoint Connector/Jive, Newsgator, Yammer, Chatter, and (heaven forbid) building the social functionality into SharePoint yourself). Which option you go with really depends on a number of factors that we try to spell out...we're hoping that this white paper can bring a lot of clarity to this subject since we are talking to people about this every day. And the Jive + SharePoint story has incredible momentum for companies that have mature viewpoints of both products. I think your white paper would be great to look at. My company is looking into the pro/cons of SP2010 and the connector tool and how it integrates with Jive 5.0, as we are still on the 4.0 platform. Sounds great - I'll make sure that you get a copy when available. Let me know if you need my help before then. is the white paper on Jive vs. Sharepoint available yet? Not yet - we've made some good progress recently, but it's not in a publishable format yet. We are still targeting September - with the cat herding I'm doing to get input I think that end of the month is probably the date to plan on). Would you be interested in being a reviewer (so you can get early access)? All that I ask is that you actually read the paper in entirety, provide at least 3 ways to improve or suggestions, and are willing to be listed as a reviewer. Let me know (others reading this as well, feel free to DM me or add a reply if interested). I'd be interested in being a reviewer as well. I was the manager of our SharePoint portal for 4 years and am now overseeing our Jive implementation, so I have a lot of interest in this topic. yes I am very interested to be a reviewer. Thanks everyone for the willingness to get involved in this...I'm going to go after getting a space set up for this and invite you into this to give folks a way to review and contribute to the content. I'm excited to get everyone's thoughts on this important subject. We've got a secret group provisioned (thanks Ryan Rutan and Deirdre Walsh) will start sending out invites later this week/early next week. Look forward to getting everyone's input on what is covered. It's an important topic so I want to cover it thoroughly and thoughtfully. Thanks in advance to those of you who have volunteered to be a reviewer and help with the effort! My main deadline is JiveWorld (first week of October) and this has reached the top of my priority stack...so for folks just looking for the final product please be patient for just a little while longer. Here's the first version of the white paper...please drop by the ThreeWill booth at JiveWorld this week to share your input on this... two of the authors will be there - TommyRyan and Kirk Liemohn. We'll be writing a 2.0 version of this so let us know if you'd like to get involved. Thanks! Great whitepaper! I'm definitely sharing with my IT team. Here's a brief video on the SharePoint Lists App for Jive 5 that we're working on...would love to hear your thoughts on our direction. Hi! I'm on the social team at Jive and was wondering if you needed a group for this unique project. If so, let me know and I would be happy to create one. dannyryan Do you have a copy of your White paper about the Sharept connector? http://www.slideshare.net/threewill/making-sharepoint-social-white-paper - you can download a copy from there. I'm tracking who has downloaded so I have some way of notifying when future versions are published. Enjoy and let me know what you think. Also, if you want to be a reviewer/contributor in future version let me know as well. Great paper, thank you so much for sharing! Do you have an more insight on the feature and functionality comparison of Newsgator+SP and Jive? Or at a high level why you would recommend Jive over Newsgator to an organization that is already leveraging SP? It’s still SharePoint, just a “dressed-‐up” version of SharePoint. It may make it a little more fun to use, but it’s pretty much the same tool. Purpose built social platforms like Jive are designed to engage people. SharePoint has to serve many masters, so to keep pace with what customers expect and need for a highly adopted social solution, you are handicapped with a bolt-‐on approach. Danny Ryan The whitepaper is a great read ! I wanted to contribute with my thoughts around it in this document. Trying to add some additionals around the usage of SharePoint and why it can't be social without tampering with the core architecture. Glad you enjoyed and thank you for sharing your thoughts - I'll take a read. Stay tuned to this thread - we should be doing an update later this year and I'll like you to help out if you're interested. Deirdre Walsh - could you set this up for me today? I'd like the ability to invite others to the space and if you could set this up a secret space that would work well for our purposes. Feel free to ask questions and guide me through this (haven't done this yet). Hey Deirdre...I'll go ahead and set this up now....since I now know I have the ability to do so. Hey, Ryan. I actually got it setup and Danny is an admin, but THANK YOU! These are all some great discussions here, so I figured I'll just add my document I did last year comparing the two. I've been working as a developer and architect with SharePoint for a few years, and I think the 2010 version of SharePoint makes more sense now from a content management perspective now, than the 2007. People tend to forget that SharePoint is an application platform (the out-of-the-box part of sharepoint would be the high resolution permission and version handling) rather than en off-the-shelve product (I’ve built patient/journal systems/logistics and tracking systems as well as regular intranets), and focus end up on the different site definitions deployed as a part of the SharePoint package (I like the glorified storage space comment :-)). With Jive, the “big discussion” becomes supported. The one not tied to the specific project or the specific organization, but the one derived based out of interest or need rather than an assigned task. So difficult to compare, they both can be implemented in so many ways. According to me, you can bend and modify SharePoint a whole lot more (since you start from scratch basically :=), but Jive is a more appealing and user friendly experience from the beginning. And, the most important part I guess. Jive enables a way to transform the way you do business, in that sense that you can collaborate around a process by utilizing the “social flavor” that Jive has. Regardless if it is getting all the right stakeholders and roles in insurance claim and collaborate around that, to peer2peer networking and crowdsourcing in a high-tech external communities. Ashley Sokal - nice job with this analysis. Would you be interested in helping out with the next version of http://www.slideshare.net/threewill/making-sharepoint-social-white-paper ? We'd love to have you as a contributor. Do you have any thoughts about Sharepoint 2013? Hi Bianca, sorry been relatively heads down for the past few days building to the cisco partnership announcement and hadn't had time to respond to this. Hi Bianca, it looks like Luis Folgoso did a review of Jive and SP 2013 with the analysis attached here: Re: Sharepoint 2010 vs Jive SBS. Internally we've put together lots of documentation about Jive and SP as separate entities and how they compare, as well as how they work alongside each other. If you let me know what you're specifically interested in, I'd be happy to share more info with you. Hi Mor, can you please send me that documentation - i have a stakeholder meeting this Wednesday to discuss the differences between Jive and Sharepoint 2013. I want to use Luis' spreadhseet, but will need to be able to explain the scores - in reference to his spreadsheet... does supported mean "out of the box?" I would love to see this too. We are currently investigating the future of sharepoint at DB (we are on 2007) and this would be very useful to us. We are a Sharepoint Shop. We have been running it since WSS 2.0 and now I just released MOSS 2010. I am also in the process of evaluating Jive to see if this will meet the needs of the user community for -micro-blogging and social networking. It will be interesting to see how these two play together. Once I have some testing done, I'll let you all know. Do you have same for Sharepoint 2013, many customer starting to talking Sharepoint 2013 has everything and no need new Social Business Solution jike jive or top of Sharepoint. We looked at SP2010 (with Newsgtor). A glaring shortcoming (and I suspect this persists in 2013) is the inability to associate comments/discussions with documents. I want to share a benchmark between Jive and Sharepoint 2013. You can select the importance of every feature for the customer and get a global result. This is really awesome Luis Folgoso !! can I share internally with Jivers? Just came across your spreadsheet Luis Folgoso very impressive piece of work! We are evaluating SharePoint 2013 currently (already a 2010 shop) and your spreadsheet provides some excellent insight with regard to the 2 platforms. HI Luis, I love this spreadsheet! When you say "supported" - does it mean that it is an Out of the Box feature? Honestly, I don't think the ratings for both Jive and SharePoint 2013 are particularly accurate. I see many where I would rate SharePoint much higher (especially for doc oriented features). I'm seeing Microsoft position a combination of Yammer and SharePoint as their competition to Jive. Yammer acts both as a standalone IM client and as a widget within SharePoint sites. How the combination compares to Jive. What about SharePoint social? We shipped basic social features with SharePoint Server 2013, and over the last year and a half I’ve had many people ask me whether they should implement SharePoint social or Yammer. My guidance has been clear and consistent: Go Yammer! While we’re committed to another on-premises release of SharePoint Server—and we’ll maintain its social capabilities—we don’t plan on adding new social features. Our investments in social will be focused on Yammer and Office 365, so that we can innovate quickly and take advantage of the viral user adoption that is so important to the natural network effect that makes social so powerful. We recognize that many of our SharePoint customers will continue to have large on-premises deployments for many years, but we’re investing to help customers easily manage hybrid environments so that they can connect their on-premises farms to their in-the-cloud social network. It might be a more important question to ask how does Yammer and Office 365 compare with Jive moving forward?